What better way to celebrate a 3 day and Holiday weekend then with a barbeque. 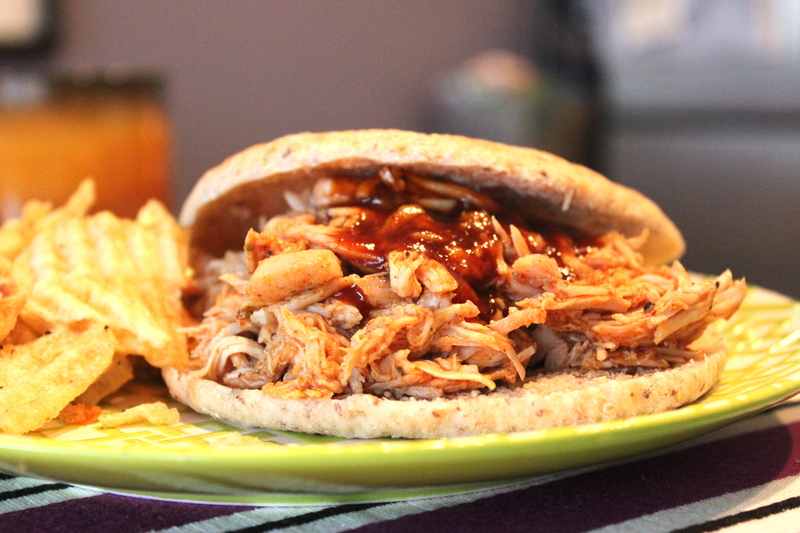 Although we’re missing my favorite part–the grill–I am able to make a killer substitute using our crockpot and making homemade barbecue sauce. I can’t even imagine how good this recipe would taste if we actually had a grill to cook it on. What can you do though–when life gives you lemons. This was the first time I have ever made homemade barbecue sauce. Not only is it super simple, it is super delicious…and the best part? It only takes 5 minutes of cooking time to bring the barbecue sauce together! I won’t ever go back to the bottled kind. Who knew it was so simple? This recipe also makes about 4 cups of sauce that can last in the refrigerator for up to a month if stored in an airtight container. Next summer I plan stock up on the homemade sauce to enjoy for weeks on end. This barbecue sauce tastes like the sauces that are provided at authentic barbecue places. It’s not nearly as thick as the sugary commercial version, so if that’s what you are looking for, this sauce is unfortunately not it. I will say though, that this barbecue sauce has much more depth than the commercial kind. It’s sweet and tart at the same time (from the brown sugar and vinegar) with a little heat thrown in (from the dry mustard, ginger, and chili pepper). We were pleasantly surprised with how delicious the sauce came out and Matt is already asking for me to make ribs to try it on next. 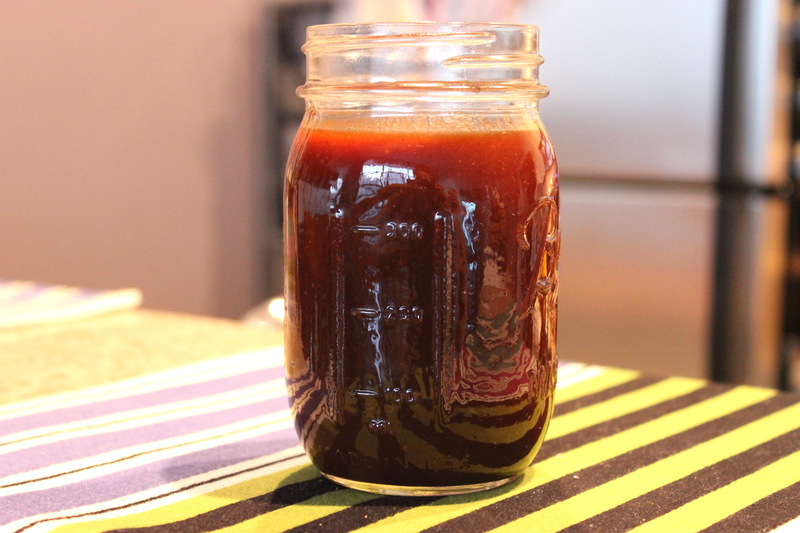 I was inspired to make my own barbecue sauce because the more I learn about the production of food in our country, the more conscious I am about what we are putting into our bodies. I am really trying my best to become an informed cook to protect the things my husband and I are consuming. So many products have ingredients that you–1. don’t know you’re eating or 2. loads of artificial preservatives and additives. It gives me piece of mind to know exactly what kind of products we are consuming on a daily basis. It is also a bonus because it is good for our bodies too. I would say the only packaged food we eat on a regular basis is 90 second rice and that’s the way I intend to keep it for the rest of our lives. I splurge on a bag of chips probably every three months (but even those are typically organic) and in moderation. I really believe that your body does reflect the fuel that you put in it and you can’t expect to feel well if you aren’t doing your part to treat your body well. That is why I enjoy creating recipes like my crockpot chicken because it allows us to always have a healthy protein on hand and sets us up to make delicious meals with very low effort. I hope you enjoy the Holiday weekend:) Matt’s birthday is just around the corner, so I’ll probably spend much of this weekend studying and brainstorming what menu I should make for his birthday dinner. Definitely going to try this one! Always looking for a good crockpot recipe. Happy SITS day! oh my gosh! This is such a mouth watering dish from the sound of it! 🙂 Thank you for sharing! Thank for stopping in! It’s fantastic! I’ve never considered trying to make my own BBQ sauce. That’s a great idea!! I hope you enjoy it! It also stores great and makes a lovely summer gift if stored in a mason jar! Thanks for the recipe. I have one that my mom made that is awesome, too. Making your own specialty items will also make memories for you. Enjoy your SITS Day. Love recipes that are passed down! Thanks for stopping in! This looks delicious!!! Thanks for sharing this amazing recipe! Thank you! It also feeds a crowd with little prep. Thanks for stopping in! Yesterday I was trying to find a homemade barbecue sauce recipe because we were completely out. Your recipe reads very well. I will post pictures with my pulled chicken later this week. Gorgeous photography and these pulled chicken sandwiches look to-die-for!